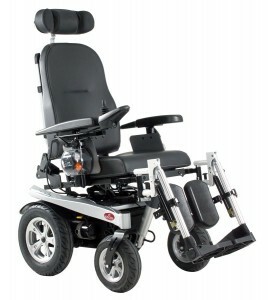 The Excel Airide X-tend electric wheelchair Excel that do reflect the current market needs. This product is significantly lighter, easy to maintain, complete modular construction and fully adaptable to user requirements. Excel has the power wheelchair reinvented. Ready for tomorrow. The Airide is cleverly designed, easily adaptable and versatile as well as front- and rear driver. Without additional components or complex constructions, but simple and effective to convert. In a minimum amount of time the Airide is ready for use as a front or rear wheel actuator. When Airide modular no buzzword but a real added value. From the base, the Airide can be built up so that the most ideal match users arises. What if there are other needs arise during use? No problem; the option and accessory system is designed so that afterwards all options are still mounted. Flexibility and cost efficiency make the Airide the electric wheelchair of today and tomorrow. If two electric adjustments are desired and / or lighting, Excel Airide X-tend is implementing the most suitable.